Reliance Jio has launched the second version of the JioPhone during its Annual General Meeting in Mumbai. The new JioPhone 2 builds on the first generation of the feature phone. 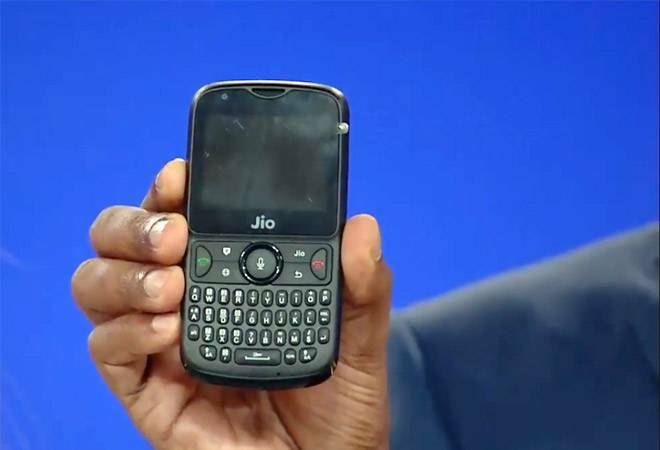 Reliance Jio has launched the second version of the JioPhone during its Annual General Meeting in Mumbai. The new JioPhone 2 builds on the first generation of the feature phone. The new phone has a screen size similar to the previous generation but it comes with a QWERTY keypad for easy typing. This keypad also gives its a design language similar to popular Blackberry phones. One of the biggest updates that the new as well as older JioPhone will get is the support for popular apps like Facebook, WhatsApp and YouTube. These apps will be available commercially from August 15. The JioPhone 2 comes with a 4-way Nav key. In terms of connectivity the device will feature LTE Band 3,3,40, 2G Band- 900/1800 4G. The device is capable of conducting LTE Cat4. The JioPhone 2 is also capable of using VoLTE and VoWiFi for calling over the internet. The phone can accommodate dual SIMs (nano). The screen is 2.4-inch QVGA display. The device comes with 512MB RAM and 4GB of internal storage. A 2000mAh battery powers the new JioPhone 2. The phone can also house an SD card up with memory up to 128GB. For optics, JioPhone 2 will come with a 2 Megapixel primary camera and a VGA camera on the front panel. The phone's uses KaiOS as the operating system. The feature phone will also be capable of functionalities of FM, Wi-Fi, GPS and even NFC. The new JioPhone 2 will be available alongside the older JioPhone. The company will start selling the device from August 15. The device is priced at Rs 2,999. Buyers still interested in buying the older JioPhone can use Reliance Jio's new Monsoon Hungama Offer. Under this offer, existing feature phone users can exchange their old phone with a JioPhone at a price of Rs 501. The offer will go live from July 21. Despite the company's claim of an effective price of Rs 0, there was an entry price of Rs 1,500. With the new offer in place, the user can get a JioPhone by paying Rs 501 and exchanging their older feature phone.